The Transportation Hall is an outdoor area of the Old Clockworks in Luigi's Mansion: Dark Moon. The Transportation Hall is accessed by taking the north door on the second floor of the Roundhouse. The Transportation Hall is a long hallway with a large conveyor belt making up a majority of the flooring. Luigi cannot walk across the hall due to the conveyor belt; rather, Luigi needs to go room to room in order to reach the end of the hall. 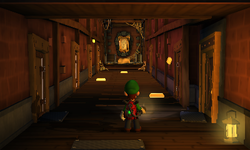 At the end of the hall is either a portrait of a key or coins, depending on the mission, and a gear spring that launches Luigi over the barricade blocking the portrait. The first door on the bottom right leads to the Roundhouse while the other two doors on the right takes Luigi to the Container Yard. The first two doors on the left takes Luigi to the Finishing Room while the other two doors take him to the Kiln Room. The door on the south leads back into the second floor of the Roundhouse. During C-3: Roundhouse Brawl, when Luigi first enters the Transportation Hall, he sees a Boo hanging a portrait of a key. Luigi needs to get this key in order to gain access to the Roundhouse where the Ancient Poltergeist is. To reach the portrait, Luigi must go into the Kiln Room, then the Container Yard, and finally the Finishing Room. During C-4: Play Catch, the Polterpup runs through the Transportation Hall. After Luigi chases the dog through the Finishing Room and Container Yard, the Polterpup stops in the middle of the Transportation Hall, which is Luigi's chance to capture it. This page was last edited on May 1, 2017, at 21:23.